Is the Kentucky Derby Horse Race the fastest sports event of all sports events? Must be right? Well whatever it may be, we love any excuse to invite friends over. This year we're having a few friends over to watch the race and I'm not going crazy with a hard-to-prepare spread of food. I'm serving my favorite snack with a twist...a chip N dip bar inspired by a few of our favorite flavors from Kettle Brand. Make sure you're sitting down because these flavors are going to blow.your.mind. Kettle Brand Moscow Mule. Kettle Brand Sriracha. Kettle Brand Maple Bacon. Each flavor is more delicious than the next! Kettle Brand Moscow Mule: I found this chip sweet and delicious so I wanted to pair with a fresh, creamy dip. I made a pistachio cheese for this guy. 1 8 oz tub of whipped cream cheese 1 8 oz log of goat cheese palmful of crushed pistachio (plus some whole to garnish) Mix all the ingredients together and garnish with the whole pistachios. Kettle Brand Maple Bacon: To offset the sweet taste that I found in this chip I whipped up a spicy mayo. Here's how I made it - 1 cup mayo 1 cup sour cream 1 palmful of shredded cheese (I used white cheddar) 1/2 palmful of grated parmesan cheese several shakes of hot sauce Mix it all together and serve chilled. Kettle Brand Sriracha: Now I burned my face off with these chips. Oooooooh boy were these spicy! To cool off my tongue I paired these bad boys with a spinach dip. Truth be told? I picked up a store bought version and mixed in some fresh spinach for a powerful flavor. Now what are we drinking? 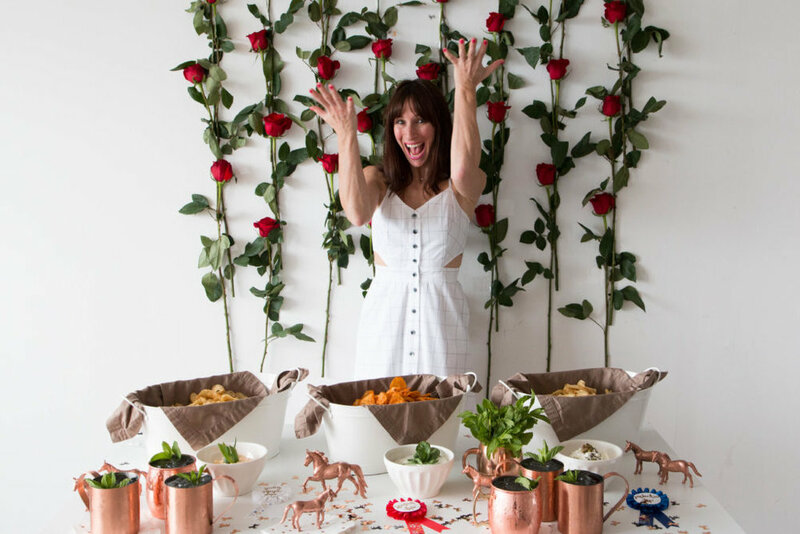 Well Moscow Mules of course! Goes with the Kettle Brand and it's cold, refreshing and delish. 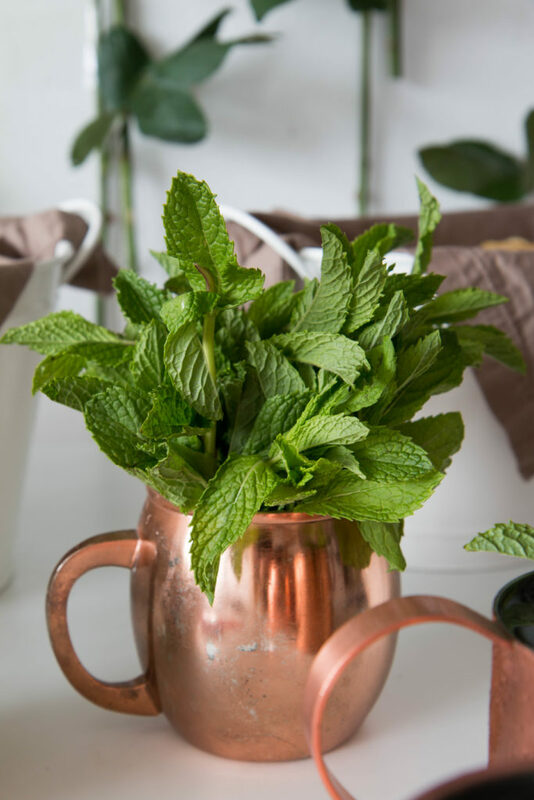 It's also a great update to the classic Derby cocktail the Mint Julip. Plus...it can be made with Bourbon, my husband's favorite. You'll have a bunch of mint leftover. Put it in a cup or mug of water and set on the table. Looks pretty, smells great and guests can pick off more mint leaves to add to their cocktails if they wish! First of all, we created a "run for the roses" backdrop. Literally, the easiest decor of your life. Tape up long stem roses to your wall, upwards and downwards and boom. Does it get more stunning? How about a nod to the horses? With the Moscow Mule copper mugs on our table, we decided to buy some toy horse figurines and hit them with copper spray paint. HOW DARLING?! Last but not least...I found horse shaped (copper and black!) confetti at my local party store. I was so excited I squealed. Now who are we betting on? Happy Derby Day friends! This post was sponsored by Kettle Brand but my deep love of potato chips is all natural.